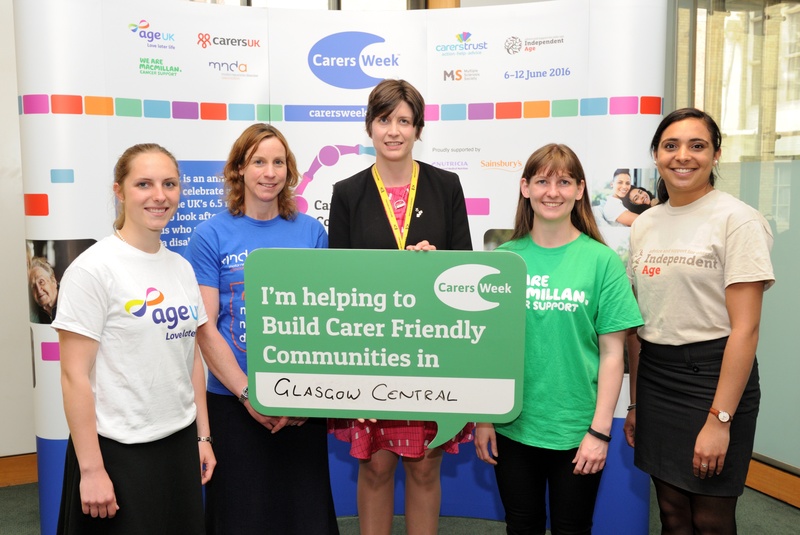 Alison Thewliss MP today pledged her support to carers across Glasgow Central as part of the national Carers Week 2016 awareness campaign, which runs from 6-12th June. There are 6.5 million people in the UK who care for a partner, relative or friend, of which 6324 carers are in Glasgow Central. The seven charities driving Carers Week 2016 are calling on individuals, organisations and services throughout the country to improve the lives of carers by building ‘Carer Friendly Communities’ – encouraging all parts of the community to think about carers and do things differently to support them. The call comes after research for Carers Week revealed that a combination of inadequate support from local services and a lack of understanding about caring from wider society is having a negative impact on carers’ health, wellbeing, relationships and finances. “With an ever increasing number of families taking on caring roles for older, ill or disabled loved ones, it is great to see MPs showing their support for carers. While carers have told us that it makes a huge difference when they are recognised and supported by their local services and communities, too many carers tell us they struggling to balance caring with other areas of their lives. By working together during Carers Week we have a huge opportunity to make our communities more Carer Friendly and make a difference to those who contribute so much”. Carers Week is made possible by Carers UK joining forces with Age UK, Carers Trust, Independent Age, Macmillan Cancer Support, Motor Neurone Disease Association and MS Society.